Everyone loves barbecue! As the warm weather continues to roll in, it’s time to switch gears into cookout mode. It’s hard to say no to a hot plate of barbecued goodness. The DC area is known for its wide selection of international cuisine, but let’s not forget about the great homestyle American barbecue you can find around town as well! Check out these delicious DC barbecue spots near 5333 Connecticut Ave. They’re sure to tickle your tastebuds and leave you satisfied yet coming back for more. Fat Pete’s is a DC staple and has been voted #1 barbecue by the Washington Post. Feeling hungry? Load up on a platter and choose from classics such as sliced brisket, NC chopped pork, ½ lb. barbecue chicken, and more. They have great sandwiches as well, and their smoked wings are to die for. One of the best parts about Fat Pete’s Barbecue is their selection of sauces. They have Alabama White, Texas “Mop Sop”, Memphis-Sweet, KC-Spicy, and others. For the thirsty, they have 16 cold brews on tap to choose from. Fat Pete’s Barbecue is located just down the block at 3407 Connecticut Ave., NW. Pitmasters is a hidden gem that’s sure to bring you back for more. Local favorites include the St. Louis ½ rack, prime beef ribs, and the “broasted” freshwater white perch. The beef ribs require 2 hours of smoking—that’s how you know they’re legit! Don’t forget the Southern sides—bring on the mac ‘n’ cheese, cheddar biscuits, fried okra, and fresh cornbread. Wash it all down with a sweet strawberry lemonade. Absolute homestyle perfection! Hardy’s is a food truck located in Bethesda, about 1.8 miles from 5333 Connecticut. They feature great prices and meats that are hand-rubbed with blend of spices. For that authentic cookout taste, they use a live-wood smoker with genuine hickory, oak, and maple. Be sure to try their beef brisket, pulled pork, or their top-selling smoked barbecue meat fries (amazing!). The smoked barbecue meat fries features seasoned fries, your choice of smoked meats, melted cheese, and barbecue sauce. Need we say more? The menu can sometimes change from day to day, so you might want to give them a call to check up before you visit. BBQ in Style at 5333 Conn. Ave.
Can’t make it out to eat? Eager to try your own recipe? Stay in and create your own barbecue creations at 5333 Connecticut Ave. Cookout in style with our rooftop stone countertop with built-in grill and stainless steel cabinets- perfect for gatherings or personal barbecue sessions. Also, the surrounding neighborhood is full of great markets and stores where you can get the choicest meats and freshest ingredients. Grill on! 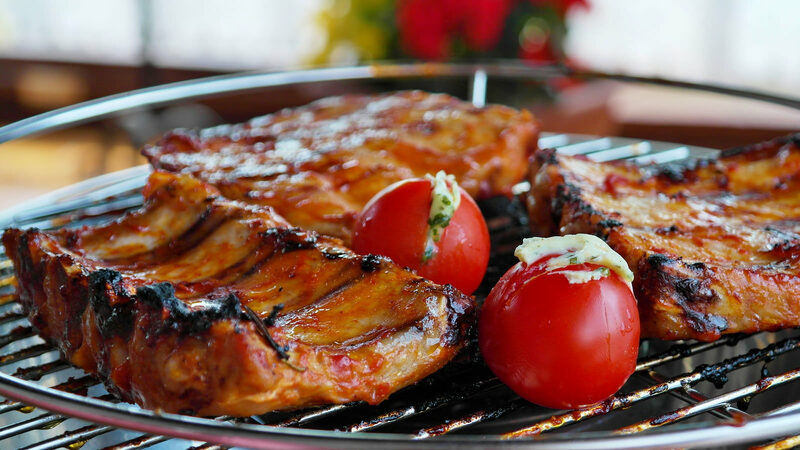 There’s nothing like the smell of barbecue on the grill on a warm sunny day. Are you interested in living in the heart of DC near all these great barbecue joints? Contact us at 5333 Connecticut Ave. to learn more about luxury historic living in DC. We have floor plans for everyone—schedule a tour today!